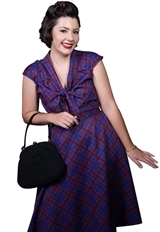 It's a A-shape retro dress with a bow in bust, ruffles in shoulders. Waist belt, side pockets and side zip. Standard size approx. length: 43 inches; Plus size approx. length: 46 inches.